Long-term projections for growth in the search business are more in the 15% to 17% range. Yet analysts estimate that 91% of Google’s revenue still comes from the AdWords and AdSense business model that Google built around Page and Brin’s breakthrough PageRank algorithm. Even more telling, an estimated 99% of its profit does too. This year’s projected earnings growth of 18% is a third of what Google averaged over the past five years. A lot of companies would kill for that growth, but for technology companies, and Google in particular, those numbers don’t impress. Google is rounding a corner that all the fruit smoothies at its Silicon Valley campus make it hard to pull back from. This year Google has joined the ranks of just about every great technology company before it, including IBM, eBay, Cisco, Microsoft, and Oracle. Google, against its will, and defying its massive cash hoard, is transitioning from a growth company to — and there is no kind way to put it — a cash cow. Marissa Mayer, head of search at Google, says the company doesn’t provide financial guidance, but contends that Google doesn’t need a huge second act, a collection of smaller businesses will suffice. Mayer of course is one of the lead players in the infamous “41 shades of blue” episode that caused designer Doug Bowman to flee Google. I tend to mention that incident a lot because I think it points to one reason (among surely many) why Google fails frequently at engaging it’s user in a long-term relationship (see: Google Buzz). In the end, Mayer’s nonchalance that search (with advertising) will remain the core and dominant part of Google’s empire might prove pragmatic and even wise. It’s not a business that’s going away and honing it and expanding on it might be a lot smarter than attempting to teach a middle-aged dog new tricks. To repeat Coates’s thoughts, Google’s engineering strength makes it a perfect utility company. Though the prospect might be as unsexy as Google’s UIs, it might be time to embrace that strength and build on it. Amazon beat them to utility computing and storage with AWS and EC2, but Android demonstrates that Google is willing to consider a future in which their [invisible] engineering prowess underwrites the visible products of others. It’s a good sign. You only need look at the design convulsions of Ford and GM over the last 10 years (in particular the various retro models) to see that most design is either adding more and more lipstick on the pig or worse, adding fluff to a product (or presentation: think colour gradients in text boxes in PowerPoint slides) that makes it less usable. 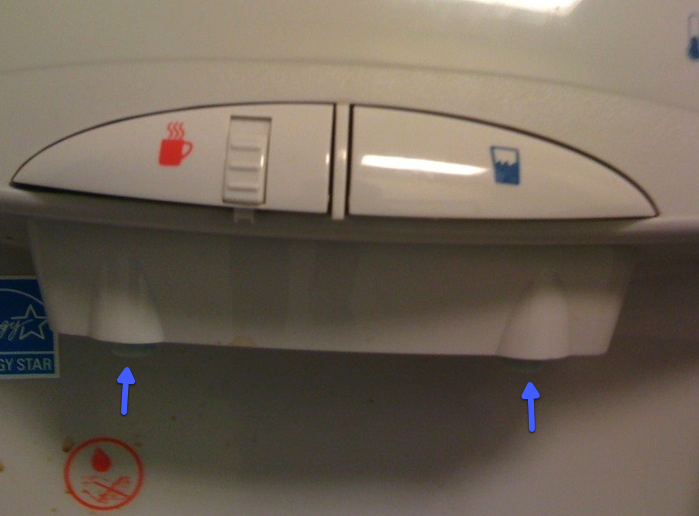 As you can see from the above picture, if you were to position your cup below the red icon or the circular hole on the base filter, the hot water would in fact pour out a bit to the left of your cup (blue arrow(s) added by me), most likely on to your hand. 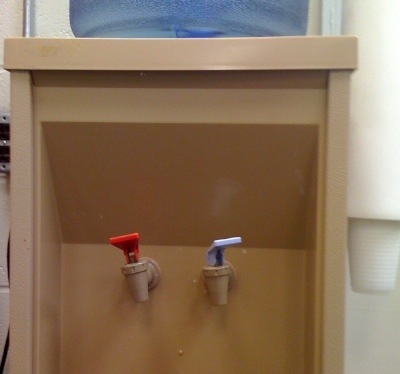 Note that only the coloured icons and the base filter are visible from the top (Picture 2), your view when you are filling water at the cooler. It is not clear to me if there is some usability testing that is performed at GE before these products are released. But what seems likely is that the function (“how it works”) is a somewhat distinct process, at GE, from the form (“how it looks”). And the 3D stuff, with a weird perspective on “walls”, just seems silly. 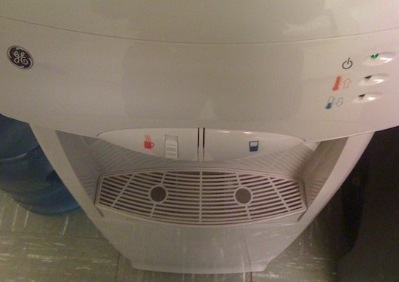 I can see how he may find it silly, but in my usage I found the walls quite a useful feature, psychologically speaking. 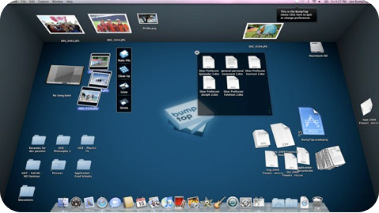 Despite the large collection of useful widgets on my Mac OS Dashboard, I rarely bring up the Dashboard to access the information or operation that these widgets provide. Why not? Apart from the fact that the Dashboard takes forever to update, somehow, bringing up the Dashboard, visually an overlay on my desktop, seems to neither fit into my workflow nor appeal to my instinctive usage patterns. On the other hand, in the few days I have been using BumpTop (intermittently), the ability to create sticky notes on a wall (admittedly, a particular application, and not a replacement for the Dashboard) has resonated well with my impulses… to look for a note on a wall seems, well, just the right thing to do! It helps that BumpTop causes no increase in CPU utilisation on a quiescent system or when I working primarily within one application. I am not sure if I will stop using Qu-S and keep using BumpTop, but it would be interesting to know what those who study UI/UX design think about the ideal way to present informational widgets and tiny apps. I left Tumblr and WordPress in to give some relief to your eyes. Take a look at the screenshots from iTunes 9. It looks like Apple is (regrettably) returning to the white look (also note the blue hues for the checkbox). As well as (again regrettably) adopting the grungy buttons look pioneered by YouTube and adopted, with predictably shiny excesses, by Windows. Or is this just a conservative aesthetic instinct on my part? On the potential plus side, one day perhaps we will see the candy/lozenge scrollbars in Mac OS X replaced with the more subtle ones that iTunes has been sporting for a while. Yeah, what she said. 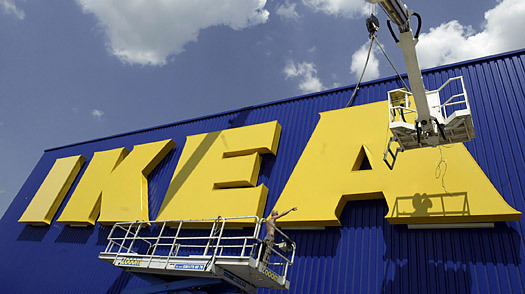 What were you thinking IKEA?